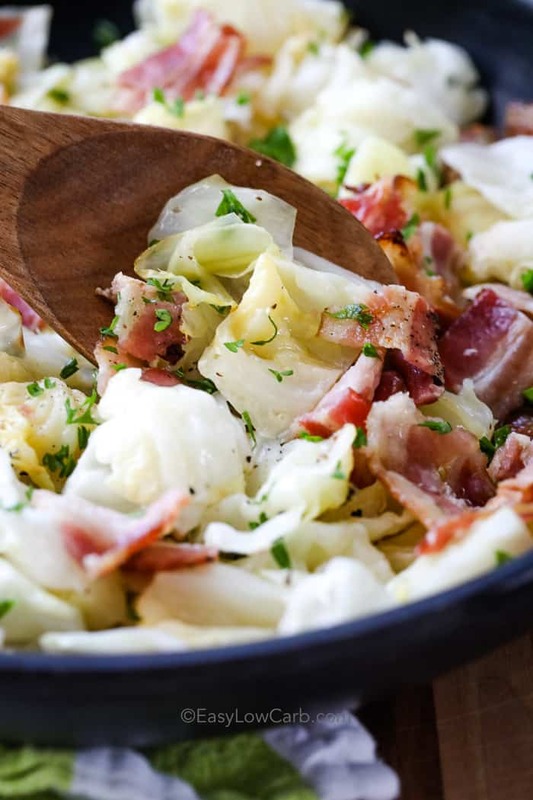 This classic fried cabbage with bacon recipe is our go-to dish when we need a quick low carb side. 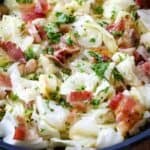 Bacon, cabbage, onions, and seasonings are sauteed until tender and flavorful. Serve this dish alongside spaghetti squash with meat sauce for a perfectly balanced low carb dinner. What would comfort food be without a few fried cabbage recipes? If you grew up in an Irish family or any large family, the smell of cooking cabbage is probably etched into your memory! But done right, it’s no wonder why cabbage has become such a staple in low carb lifestyles around the world. Today, there are new and palate pleasing ways to get everyone in the family to eat cabbage! From bacon wrapped cabbage to this fried cabbage with bacon recipe, the famous keto duo will not soon be forgotten around here. This versatile fried cabbage recipe is a cinch to pull together with nearly anything left in the fridge! Bacon? Sure! Sausage? Sure! Bell peppers, onions and garlic? Go for it! A member of the Brassica family, there are only 5 grams of carbs in cabbage per cup, so it’s no wonder cabbage is an all-star on so many lifestyle menus these days. Cooking cabbage with onion and garlic is a great way to get filled up with fiber for vegan and vegetarian diets. For a paleo or keto side dish or entrée, try fried cabbage with bacon. Served hot or cold, bacon and cabbage are always a great combination! A great Fried Cabbage and Bacon recipe is all about the proper cooking of the cabbage. Sure, it’s easy to whip up some bacon and literally, any type will do- as long as it’s meaty and crispy! Make sure your cabbage is evenly cut so it fries up uniformly in the pan. Heat the oil of your choice and add the other ingredients like onions, garlic, or bacon. The trick is to add the cabbage last so it soaks up the flavors without getting greasy or soft. You want a little crunch! Remember to season with salt and pepper. Cooking cabbage properly makes the difference between a taste disaster and a request for seconds! Don’t use too much oil or fat or crowd the pan. Cabbage needs to be cooked quickly in a hot pan to avoid overcooking. Don’t forget that Fried Cabbage and Bacon tastes great as a cold side salad served with a polish dog for those game day celebrations! This classic fried cabbage with bacon recipe is our go-to side dish when we need a quick low carb side. 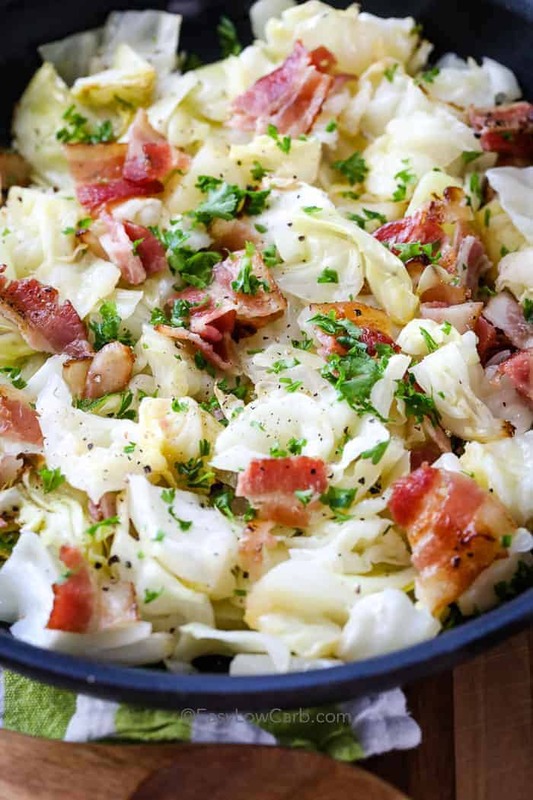 Bacon, cabbage, onions, and seasonings are sauteed until tender and flavorful. Cook bacon over medium high heat until crisp. Using a slotted spoon, remove bacon and set on a paper towel lined plate. Reduce heat to medium and add the onion and garlic to the bacon fat in the pan. Cook over medium heat 5-7 minutes or until onion is softened. Add cabbage, cover and cook stirring occasionally until tender, about an 15-20 minutes. Season to taste.